About two hours before this morning's grey dawn, a series of explosions tore through a propane depot in the northwest corner of the city, shaking buildings and homes, shattering windows and waking people as far as 10 kms distant from the scene. 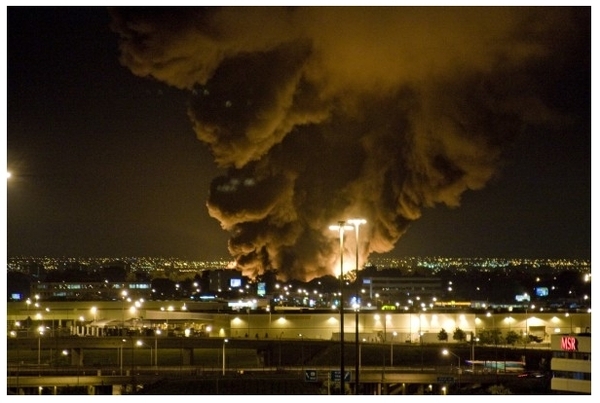 Fire and smoke shot to heights equal to a 20 or 30 storey building and led many to think (worry? fear?) that a jet airliner had crashed, a terrorist attack had taken place, the city was being bombed. This was breaking news with a capital 'B' and at this point, six hours distant from that 3:30 am blast, it offers some intriguing lessons in how coverage of these events is evolving in a world where digital cameras and web access are almost ubiquitous. Bottom line - in aggregate, citizens journalists out-performed their professional counterparts getting news out faster, offering more details, and better images and videos. They also made more mistakes and had a high noise to signal ratio. Mainstream media were slow off the mark and while they depended on the citizen journalists, they failed to make the most of the possibilities that material offered. See the bottom of the post for my thoughts on how to do that. Toronto's a media-rich city: four paid dailies, two free dailies, several city news blogs in addtion to more than a dozen local radio and television stations. I can't cover them all, but took a look at the four dailies (The Globe, The National Post, The Star, and The Sun) and the two big place blogs (Blog.TO and Torontoist). I did a similar comparison earlier this year (when the transit union launched an unexpected, but legal, strike on a Friday night at press deadline time) and the results are pretty similar - none of the dailies have figured out yet how to blend the strengths of their newsroom (speed, accuracy, access) with the new possibilities opened up by an always connected citizenry - but most of them are trying. The Star, with the city's biggest newsroom (although I can't imagine they had more than a single person on duty when the first blast hit), produced the fullest account, with pretty admirable speed. Police, fire, eyewitness reports, plus links to two of the eight or so citizen videos of the blast I found online. The article had commenting enabled (they don't always) and you got a bit of a flavour of the impact on the city, which is useful, if basic. The Globe and Mail seemed entirely asleep at the switch, relying entirely on Canadian Press for it's text story, still photos and video. (CP's video was quite good actually, blending citizen video with their own images and overlaying professional reporting and a very competent voice-over.) The Globe (and the Star) both appealed to readers to send them stories, videos and photos, but if they got any, neither acknowledged it.) 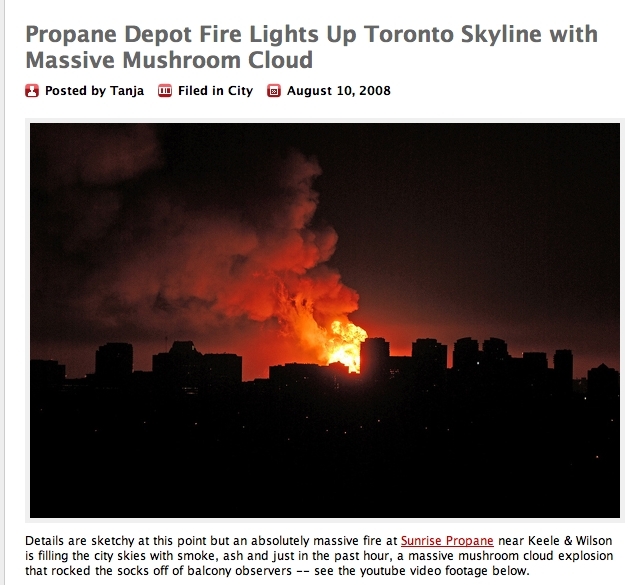 Lots of comments, though, including people offering links to other sites with video of the blasts, the Toronto Fire Dept's live response web page, even academic and news references to other propane explosions and the risks the storage depots pose. Good stuff that a smart web team might have referenced in the story - but their readers did it for them. It's a stark demonstration of how people use — or want to use — the web: to share information, to learn more by sharing what they know, using the familiar web tools Flickr, YouTube, Wikipedia, the collective memory of the web itself. The Toronto Sun, a local tabloid that should have positively owned this story, proved weakest of all, offering a tepid, staff-written brief, a still photo taken by a local photo blogger and the same, albeit spectacular, YouTube video that everyone else used. (It's embedded at the end of this post). I'd give them credit for looking to the web for on-the-scene content, except they appear to be using it simply as a replacement for their own staff, rather than a complement to it. "Check back at torontosun.com for updates" it promised, but for four hours they offered nothing beyond the original blurb. 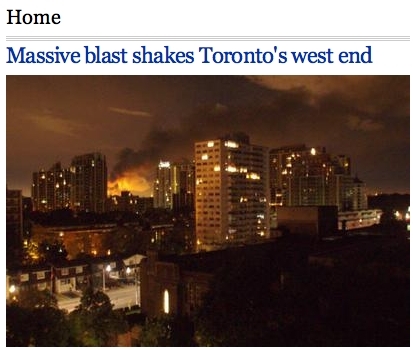 Finally more than six hours after the blast, they updated their coverage — they dropped in the Canadian Press story. 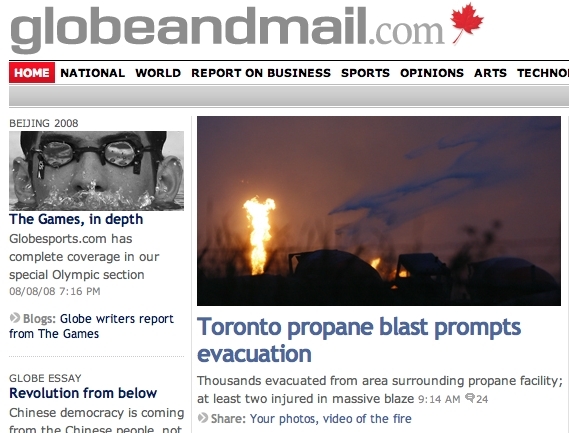 The National Post turned to their Toronto news blog, Posted Toronto, to handle coverage, blending some staff reporting with reader submissions and a fairly determined harvesting of public content on the web via Flickr and YouTube. They created their own interactive map using Google's dead-easy map tools and used it to locate the event, show the evacuation area, host photos and reader comments. Very smart and simple. Like last time, this overall approach proved to be the most effective way to get out ahead of the story, offering readers a rich, detailed - if fragmented and at times inaccurate - story. Up until about 9 a.m. nobody could touch them, but then they fell into the same hole as before: they failed to take the story beyond the exciting, moment to moment breathless coverage. 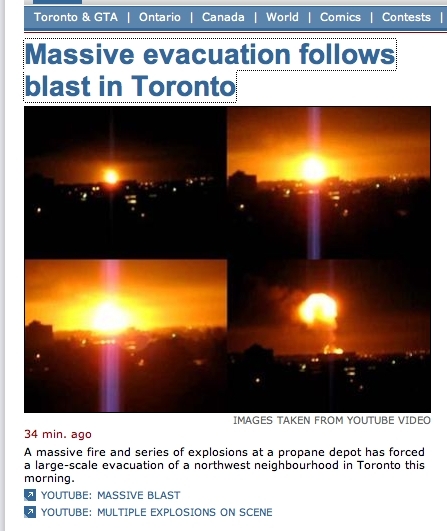 Torontoist - The local franchise of the continent-wide chain of place bloggers, failed miserably and utterly, totally ignoring a major news event in their town that closed major highways and led to mass evacuations. It wasn't the first item they posted Sunday morning, nor their second. It wasn't until almost noon, over 8 hours after it happened, that they finally put up a weak wrap-up that simply pointed to what others had done. A text-book lesson in how not to cover your city. BlogTO.Com did two hours of live blogging, from about 7am to 9am, inserting the best videos, views from the highway web cams and reader-submitted photos to their BlogTO Flicker pool. 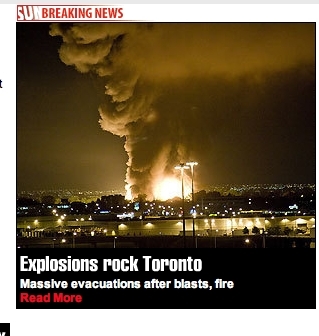 It was a darn good job of covering breaking news with no resources but the web and your readers at your disposal. Final Thoughts: The best images (and video), without exception, came from citizens, who ranged from dedicated semi-pro photobloggers to startled out of the sleep cell phone videographers shooting from their distant, high rise balconies. (Where the heck were the pros?) The best details came (eventually) from the mainstream media who found and interviewed ground zero witnesses. But as the story was developing the best details came from ordinary folks texting, emailing and commenting. Nobody succeeded in blending together professional journalism with the best their fellow citizens had to offer. Nobody. The best either covered breaking news like they always do (The Star) with a few sprinkles of web pixie dust (adding the YouTube videos); or they did a great blog job for a while (The National Post), harvesting the best the web — and it's citizens — had to offer, without ever doing the real journalism that sifts the wheat from the chaffe and gives us a strong story rich with facts, context, analysis, and colour. There's no reason we can't do both. When breaking news happens, start live-blogging it, relying on readers and fellow citizens to provide us with hot, local, first-person information (text, images, video - maybe even audio). Solicit it and use it — highlighting contributions while inviting more. Search the web for the contributions of others and link to the best. At the same time let slip the hounds. Deploy professionals to do what they do best, use their skills and tools and access to bring back hard facts and colour, great images and video, to craft analysis. Then have skilled web editors blend the best of them all into one magnificent package. Make sure you eliminate the inevitable errors of fact that appear during the rush of breaking news commentary and reporting. Use archives and the web to add context and a deeper, richer experience. Offer readers relevant resources and a space to share thoughts, stories, and comments. That is how we should be doing breaking news. Why the hell aren't we? Thanks for the analysis, Bill. Indeed much was left to be desired -- a lesson in what is possible even when news breaks at the worst possible time for every daily paper. Absolutely! Putting together something like this was a very powerful idea in my mind after the massive and exciting internet coverage of Katrina, years ago, and it still hasn't really come together in the way it really could. You sound like another nitwit complaining about people not voluntarily chasing enough ambulances for your liking. I'll start a fire tonight if you promise to cover it. Excellent post, Bill. Great analysis of the coverage, and how do it better. My newsroom will learn from this. Thanks Dean, I appreciate it, coming from someone with your experience. While a lack of newsroom resources undoubtedly had a lot do with how the story was handled, I'm sure that much of it is simply a failure to think through how to handle these kinds of events and then develop a simple protocol or action plan for it. I tried to address that in the follow-up post.